Two huge technology companies are about to release their own 360 degree cameras, LG with the 360 Cam and Samsung with the Gear 360. The release of these products represents the start of a 360 degree revolution and proves that big companies are willing to back the new technology. 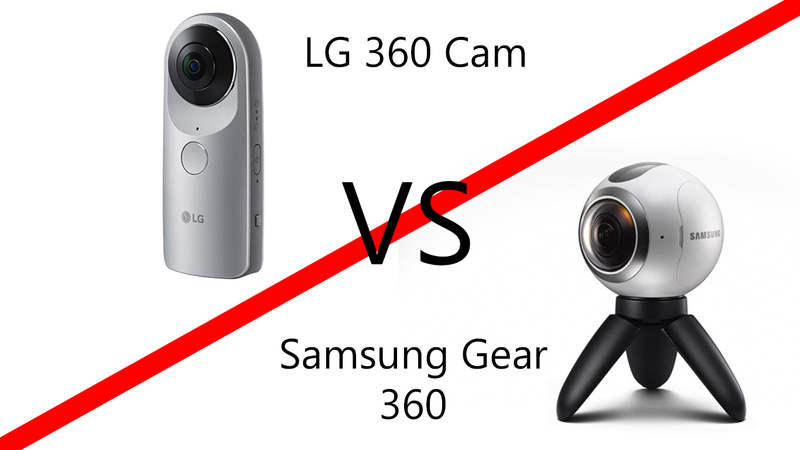 You’re probably going to be choosing between these two cameras if you want to among the first to start making your own 360 videos (See my 360 camera buying guide for more info on choosing your camera); so without further hesitation, let’s compare the LG 360 cam and the Samsung Galaxy Gear and find out which is the best 360 camera. It seems to me that Samsung is the clear winner here, in comparison to the LG 360 Cam the Gear 360 has a much higher video resolution as well as a larger battery. The combined cameras of the LG 360 are capable of recording 2K video which more than enough for any normal camera, but remember 360 cameras have to stretch the image over a much wider area and so require a much higher resolution. While 2K will produce acceptable quality video, the Gear 360 can record in much higher resolution (almost 4K) which will produce close to HD quality 360 video. The LG 360 Cam isn’t a complete wash-out though, it’s form factor is much more convenient than the bulbous design of the Gear 360 and the LG’s camera is priced competitively at under $200. Depending on the price of the Gear 360, the LG 360 Cam could be a good option for those wanting a cheap but effective 360 camera. Pre-orders for the LG 360 cam are now available at B&H Photo and the release date of the Gear 360 is still unknown.